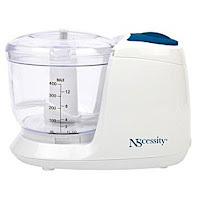 Continue from the last post… after days of searching, I ended up bought the NScessity Food Processor from Amazon. I must say it was a very good product (in the beginning). I love the compact size (did bring it with us when we travelled back to Malaysia and also on our holidays), the speed and also the finesse of the food texture. However in less than 5 months of using it, it went kaput! But because I love it so much at that time, we bought the second unit (same brand). I though probably we will be lucky this time… NOT! After using it for about 6-8 weeks the (new) machine broke again!!! The thing about this NScessity fp that I hate the most is, you have to wait until the food is completely cool before you can process it, otherwise it will heat up the motor and will eventually damaged it. Although my babysitter has been very careful when using it (as per her claimed), of course they are time when the hungry baby cant wait that long. When the 2nd unit was broken, I went straight away to baby shop and found Lindam Mini Blender – Baby Food Processor. Same size, more well known brand, so I thought it should have the same performance if not better. Turn out it was sooOOoo slow! You also have to wait until the food is completely cool before using it. And the food are barely minced at all. Definitely not the consistency that are tolerable by Z. However I think its probably still suitable for typical baby age 10+ months who starting on a bit of lumpy foods. Definitely not for first food texture though... But as it is very slow, I don’t think it is practical for baby foods. Maybe better for herbs or something.. 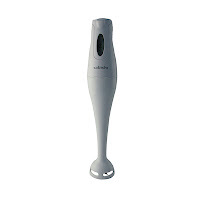 Anyway, very unsatisfied with Lindam, we ended up have to use our old hand blender instead. I don’t want to use our normal home blender for Z’s food as we used it mostly for our sambals (chilies) and spices – pedas lah! 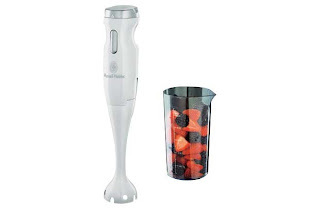 But oh my… the hand blender is actually so much easier. 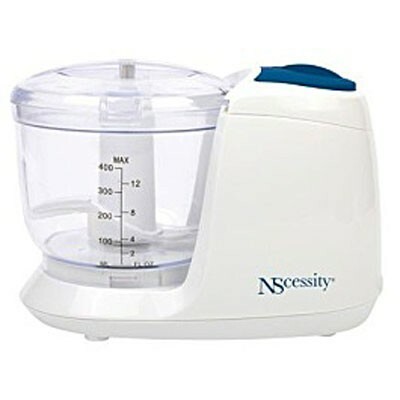 Honestly, 10 times better than the food processors. You don’t have to wait for the food to cool down. Its very easy to use. Easy to set up and easy to clean as well. 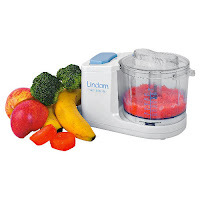 You don’t have to transfer the food to other bowl – just put the blender into the pot and few seconds later everything is pureed! No, it doesn’t have to be soupy kind of texture only. Z’s food texture is more kind of ‘thick mash’ but fine consistency. And the hand blender did a very good job even on meat! The first hand blender we used was the cheapest from local store (Dunnes Store) brand name Sabichi. I bought it for 10€ when we first moved back to Ireland (where all my stuffs still in storage warehouse). I haven’t used much at that time, but we used it for Z’s food for nearly 10 months. Negative sides are the stick blender is very bulky and this one is un-detachable. Still value for money $$ and easy to use. When that one broken, I bought the Essentials Blender by Russell Hobbs from Argos. Still at a very affordable price – €19.99. I must say this is the best blender (for baby food) that I have. The unit is detachable (you can remove the lower part) and slightly smaller than the previous one. So it is easy to clean and store. It also has 3 speed setting and comes with beaker. I never used the beaker, I just blend it directly onto the bowl. Its good for travel as well. Don’t really take up much space. Because we used it twice daily, I wont expect it to last very long. The first Russell Hobbs we had lasted for 4 months only (improper used by my husband). Still under warranty (2 years warranty) but I wont bother sending it for repair anyway, I just bought a new one straight away. Since I know it wont last long, I bought it with insurance this time (paid extra 6 euro). If anything happen within 3 years, I can bring it back to Argos and they will replace it straight away - without question :D. At least I don’t have to worry if this one is broken soon. The only problem is, its been over 8 months now and that blender is still working like a champion :D.